Helpful tools and methods are available including Clinical Micro-systems' "A Path to Health Care Excellence Toolkit: Quality by Design"
(www.clinicalmicrosystem.org) to support busy clinical care teams to move forward to assess, diagnose and treat their clinical microsystem. The path forward includes the following steps (4): "Create an interdisciplinary lead improvement team." This lead improvement team will guide the process of assess, diagnose and "treat" the rheumatology microsystem. The members of the lead improvement team are responsible for exploring the 5Ps of the microsystem using the microsystem workbook tools and worksheets. The members have primary responsibility to "bridge" the knowledge about the microsystem between the lead improvement team and the professional colleagues in the microsystem they are representing through regular multi-media communications. The lead improvement team should hold weekly one hour meetings to explore the data and information of the microsystem to make a diagnosis and design the path forward to make measurable improvements. Once the 5P assessment is completed, the lead improvement team should identify a "theme" of improvement to focus improvement activities and follow the Dartmouth Microsystem Improvement Curriculum and ramp (4) to design improvements through rapid tests of change to result in measurable improvements. 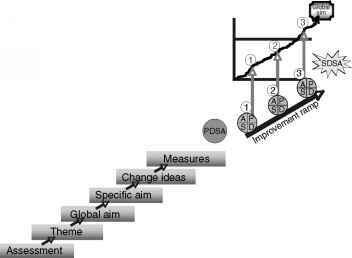 The Improvement Model is based on the PDSA model popularized by Tom Nolan and his colleagues (Fig. 7) (13). The model for improvement provides a clear path forward for making small rapid tests of change using improvement science. The model poses three questions to be answered when making changes. 2. How will we know that a change is an improvement? 3. What changes can we make that will result in an improvement? Testing good ideas using the PDSA model includes measuring results using run and control charts that track data over time. Once you have made your assessment of your rheumatology microsystem, you can begin to identify what you do well and what you could improve in your system of care. What is your diagnosis for your microsystem? 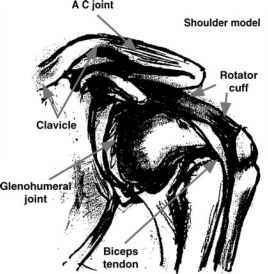 You may have multiple diagnoses related to ensuring evidence based practice consistently, improving "hand offs" in the rheumatology care process to other microsystems to ensure consistent, reliable care, improved communication within your microsystem or between other microsystems, and improved documentation processes. If you review the improvement ramp (Fig. 11), you will see after identification of a diagnosis or "theme" for improvement based on assessments, you will move through a series of steps to narrow the focus from a broad theme to a specific process. For example, you may learn through your assessment process that rheumatology patients are not regularly evaluated following recommended guidelines for laboratory or uveitis check ups. You may wish to increase the number of communications and follow up with the adolescent. This will be a specific focus. An important aspect of "treating" your microsystem diagnosis is to be mindful of "best practice" and review the literature for evidence based practice, best practices, and benchmark with other rheumatology clinics. Figure 11 Dartmouth microsystem improvement ramp. Source: Adapted from Ref. 4. Table 3 What Can You Do Tomorrow? Designing processes that eliminate waste and rework is essential in improvement work. How can we improve outcomes and processes for patients and families and at the same time improve the workplace for health care professionals? The Institute for Healthcare Improvement (www.ihi.org) and clinical microsystems (www.clinicalmicrosystem.org) provide rich resources to aid the health care professional with current ideas and methods to make improvements. When you have identified a change idea to "treat" your microsystem process, using scientific methodology to test improvements is key. The Improvement Model, PDSA provides the methodology to test ideas in rapid fashion in the clinical setting to make improvements and measure results. The model encourages answering the question "How will we know if change is an improvement?" The improvement process done through an interdisciplinary team is a continuous process. The professionals in the rheumatology microsystem should commit to long term efforts to improve and sustain processes of care. Creating a strategic plan for improvement and displaying results and progress via storyboards and data walls help to keep the microsystem alert to improvement and progress being made (4). Inviting patients to interdisciplinary improvement teams is resulting in more focused improvement that patients and families desire- not only what health care professionals decide should be improved. Patient and family involvement in clinical improvement remind us of the importance of being patient centered (www.familycenteredcare.org) (Table 3).